After a month in Bangkok and having packed up my bike, it was time to head off to Tacloban City in the Philippines, and the orphanage. I boarded the plane and after a period of relative stability once again headed off into the unknown. It was a late night 3 hour flight and combined with the one hour time change meant an early 4:00 am arrival in Manila. I cleared customs and despite the early hour was greeted on arrival by my friend Alona Magbujos. It was the first familiar face I have seen since I left home almost a year ago. I told Alona that I would make it easy on her and just take a cab into the city but she said if I could bike all the way from Ireland, she can pick me up at the airport. I've learned not to argue with Filipina women. My first impressions of Manila are that it challenges Mumbai for the size, congestion and drivers that seem to swerve in and out without really paying a lot of attention to what is happening behind them. The saving grace here is that there are lane markers which are generally obeyed and drivers who will on occasion refrain from honking their horns. As we were moving through traffic however, I was thankful to be inside a large vehicle and not on an exposed bicycle. I think I am getting soft already but feel I was able to dodge a bullet by not getting hit for 10 months, maybe it's best to stop while you are ahead. In Manila, if the drivers didn't get me the heat and humidity would have. So riding in the relative safety of an an air-conditioned vehicle was just fine with me. Alona brought me to her home and made breakfast while we caught up on our lives. A few hours later she drove me to her new business. Alona just passed her drivers test and when she settled behind the wheel crossed herself. I am not Catholic but quickly decided to put my seatbelt on and say my own prayer, just in case. I was going to suggest we take a cab but driving 15 mph through Manila was fine too. Ha ha ha. 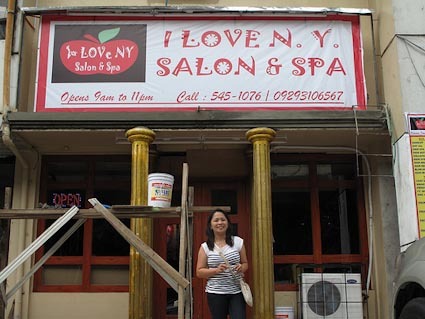 Alona came back to Manila and set up her own spa and salon. The I Love N.Y Salon and Spa is now open for business. I met the staff and had a one hour massage which was exactly what the doctor ordered after missing a night's sleep on the trip from Bangkok. 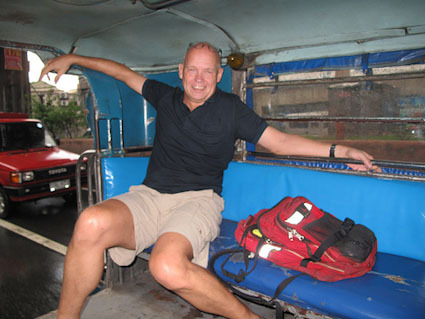 We spent the day touring around Manila including a ride in the infamous Jeepney. 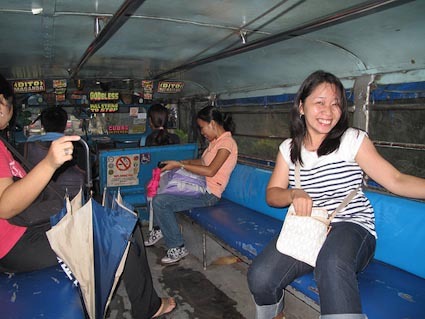 The Jeepney is a modified Jeep with an extended back end capable of carrying about 20 people. In Manila, they compete aggressively for fares and while they weave in and out, you have to hang on for dear life. This neighborhood is the home of the volunteer organization called Volunteers for the Visayas and all the foreign workers stay close. To qualify to host a volunteer the home owners have to provide a room (usually a double), fan and provide breakfast and dinner daily. When I signed up to work I paid a fee to the agency and most of that money is passed on to the family so it is important to them that volunteers come and stay in the community. 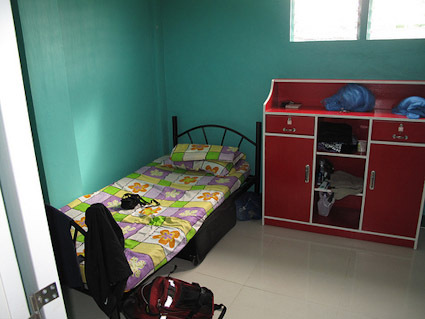 My bedroom has 2 beds, another volunteer from the U.S is coming in a few weeks and will join me. 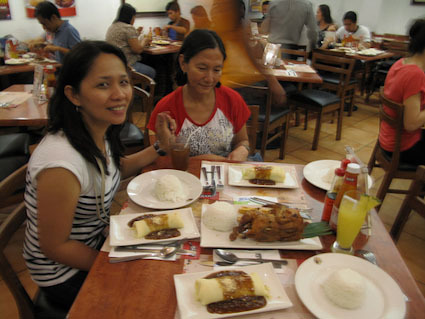 When you are in the Philippines you are never too far from food. Alona dropped me off at my hotel and we said good-bye. 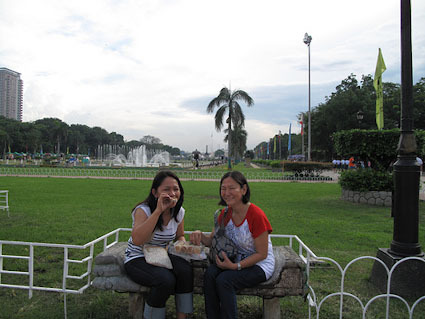 It was way too short of a visit but it was great to see her again and the new life she is building in Manila. Alona's hospitality and friendly nature is typical of the Filipino people and being around her reminded me of why I chose to come to the Philippines in the first place. On Saturday July 1st (Canada Day) I boarded a plane for the 1-hour flight to Tacloban City. 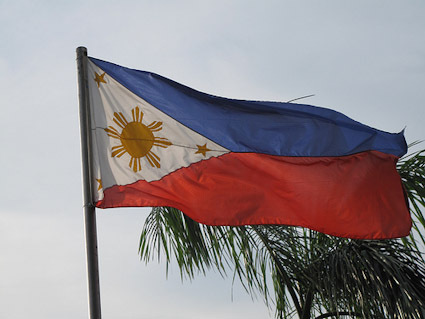 The central part of the Philippines is known as the Visaya Islands and the Capital City of the Eastern Visayas is Tacloban City. There are approximately 250,000 people here and the language is not the same as Tagalog, the native language of the Philippines. The language here is called Waray Waray but English is widely spoken so I can get by fairly easily. I had no idea if someone was going to meet me at the airport. I did not have any direct contact with the organization in Tacloban but dealt with an agency in the U.S. I walked out of the small airport and noticed my name on a sign, being held by one smiling young girl standing beside 4 other smiling faces, this was turning out very well. The family were part of my home-stay and I joined them in the rented vehicle hired to pick me up. The village where I am staying is about 4 km outside of Tacloban City and is known as Bliss. 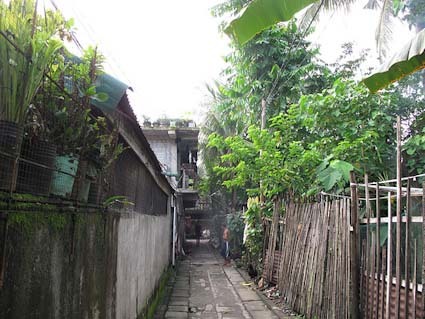 The community is very poor and as we walked down the narrow, winding path I noticed that most of the homes were little more than sheds. There were numerous young children playing accompanied by lots of roosters, dogs, pigs and anything else you wouldn't normally see in a typical Western neighborhood. I will provide more pictures of my life here soon. The host family is pretty typical for the villages of the rural Philippines. The owners are John and Marilyn and included in the house is her mother, their 2 grown sons, one daughter in law, 6 grandchildren and me. That makes 13 people in a small home and it takes a while to figure out which child belongs to whom as there are always new faces popping in and out. There is no running water in the bathroom and a shower is the bucket type which I used many times on my trip. It can be quite refreshing in a hot climate to get up and pour a bucket of room temperature water over your head. It wouldn't feel quite the same during a Canadian winter. I have a fan in the room so can manage but it is quite hot and I am having trouble sleeping through the night. If it's not the heat, the roosters that tend to wake about 4:30 will get me up. Marilyn serves my dinner at 7:00 pm and breakfast at 7:00 am and I eat on my own at one of the tables, but always with lots of people around. Dinner always include rice and usually served with a vegetable and a meat or fish. Breakfast is usually something sweet with pineapple or mango juice. I will not be going hungry but won't be gaining a lot of weight either. I started at the orphanage on Tuesday July 5th. I cannot post photos of the children so will just have to write about my experiences and what it is like here. I asked for permission to post pictures and was denied and that is understandable, they have to protect the children and do not want their images on the internet. The orphanage is the Mission of Mercy and is a Catholic orphanage run by a group of Nuns. They are funded through private donations and supported by the Church. There are now 23 children with 11 infants under the age of 2 and 12 aged 2 to 13. I was never told what it is that I would be doing but just starting helping where needed. I arrived at 8:00 am on Tuesday and said hello to all the kids and was met with some shy smiles and a lot of staring, kind of like I was back on my bike in India. I volunteered to help with feeding the infants a small bowl of rice and eggs. At one point there was a young boy in the crib in front of me and a young girl in the one beside him. I asked the helper their ages and was told that the young boy was 1 year old and although he looked a little younger, it seemed relatively normal. I was then told that the girl that actually looked much smaller was 4 years old. I was dumbfounded. A 4 year old in a crib with diapers, unable to utter a word and could not sit up on her own. She was extremely malnourished but was alive. I had no idea of the level of poverty in the countryside of the Philippines. I then went into the main area where a few of the older kids gathered. A young 9-year old boy named Richard had a ball and threw it at me in fun. I caught it and threw it back and he laughed out loud and was very excited. We kept throwing back and forth with the younger children watching and laughing with big smiles. I would bounce the ball on my head to uproarious laughter. Once again, it's often the simple things that can bring so much joy. They did not need the latest app on an ipad or the latest sony playstation game, watching a ball being thrown was enough. On a bed in the middle of the main gathering area a young girl with a beautiful smile was lying down on her stomach, propped up on a pillow and just quietly watching. I was drawn to her because she was so quiet and peaceful sitting there. Later on I realized she couldn't move. Erica Joy is 6 years old and has TB of the bone and is paralyzed from the waist down. It breaks my heart to see her watching the other kids running and playing while she lies on her back, but she always has a smile. She is an orphan girl living without family and unable to walk and still manages to smile. It is humbling to see such joy amongst children with so little yet they still seem happier than so many people I have met in my life. It's hard to complain about things when you don't have anything and unfortunately it seems very easy to complain when you have so much. The children are not actually orphans, they have been abandoned because their parents cannot provide adequate care. In most cases it is for financial reasons but also some of the kids have physical problems, often related to malnourishment from their youth. The parents have to work to feed their children so give up the ones requiring more attention. The orphanage feeds and cares for them and hopefully they will be reunited with their families at a later date. On Friday I was told that a young 1.5 year old girl named Noreen would be going home on Saturday. The staff were excited because it is always hard but rewarding to see a child leave. On Saturday I went to visit and do some teaching with the older children and noticed that Noreen was still there. I was happy because now I could see her face when her father came to get her so asked when he was coming. I was told that the father was here earlier and told the Nun that he could not take her home. They have 8 children and cannot afford them now or unless something changes, will never be able to care for her. The girl will likely be there until she is 15 and then be transferred to the adult care center across the road. The man will likely be back with another child in a year or so since the use of contraceptives is frowned upon by the church. The irony with that way of thinking is that it is the same church that ends up caring for the children because the parents are too poor. It is a tragic cycle that is really hard to understand. The infant children get 3 meals and 3 snacks per day so are well fed. The rice is mixed with various sources of protein like eggs and fish so the diet is well balanced. The kids also get healthcare and physical therapy if required. My role is to help feed the infants, play with the older ones and also to teach English and Math to the 4 oldest children. The kids do not attend school because of physical weakness or other disability but a few are very bright and could easily fit into the schools. The oldest girl is Angelina and is 13 years of age. She speaks English well, loves to read and is very good at math. She could easily join a school but she is not strong enough. She was brought in as an infant and was also severely malnourished and almost died. She has a weak heart and cannot sit in a class for so long so despite being eager to learn and very smart is destined for a very difficult life. It is very difficult to think about these things when you are in their midst so I don't. I simply spend time with them and make the present moment as special as I can. The days are tiring both physically and emotionally but I look forward to spending time with them. It is a long process to say good-bye each day. I go to each child and touch them or give them a high-five and say good-bye and that I will see them the next day. I walk out to a chorus of "good-bye Kuya". The term is one Filipinas would say to an older male so I am known as Kuya Fred. I work from 8:00 am to 12:00 and then leave for 3 hours as they eat and take naps. That was my scheduled work day but I offered to come back in the afternoons to teach the older kids that desperately need to keep up with school in case they ever get back into a normal life. I teach for 2 hours and then tutor another girl not part of the orphanage or another hour. I come home a little more humble each day. With the restrictions on photos of the kids I will write a few entries in the weeks ahead about my life here but will not continue much longer. I will be writing a final update on my bike trip shortly and will post that under the Journal tab. All updates related to my time in the Philippines will be posted under the orphanage tab. I will write again soon and post pictures of the City, my home-stay and the family. 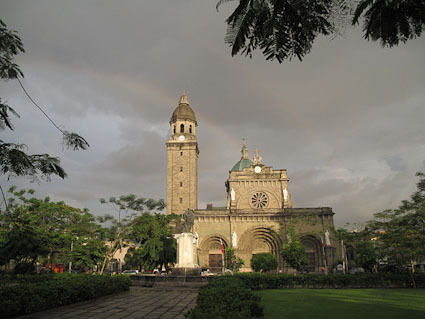 We toured some of the sights in Manila including this Church. It had just rained and the rainbow added a nice touch to the beautiful building.